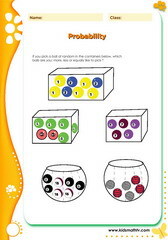 Math worksheets on probability for children in 2nd, 3rd, 4th, 5th, 6th and 7th grades. Test math skills on finding the possible outcomes on events like rolling a dice, randomly selecting items from a box, spinning a wheel etc. 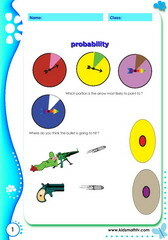 These worksheets contain illustrations and pictures that send the concept of probability across to young learners. 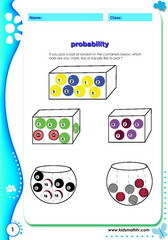 For teachers, this is a useful web page to supplement their math course, for parents, this will be useful for homework and for kids, this will be helpful preparation ahead of probability classes. 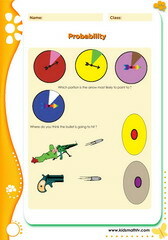 Also remember to watch videos and play games on this site. 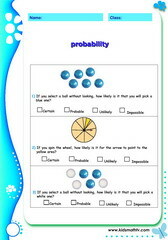 Practice Probability with wheels worksheet with this worksheet. 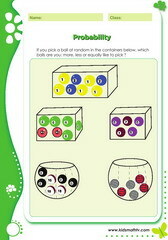 Practice Probability with balls in a box with this worksheet. 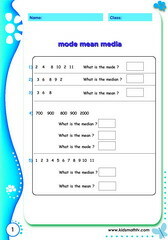 Practice Mode median mean with this worksheet. 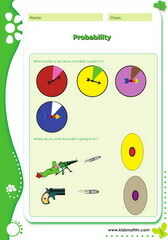 Practice Probability illustrated with this worksheet. 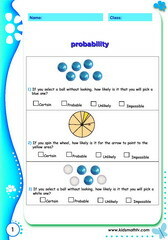 Practice Probability with this worksheet. 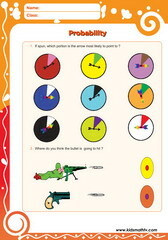 Practice Sets with this worksheet.